Thank you to everyone who came out for the opening of 1.2 cm = an exhibition of photography by Constance Thalken. The exhibition addresses the paradoxical relationship between the smallness of an invasive tumor (1.2 cm) and complexity of its impact on the body and mind. The work speaks to concerns of mortality, the nature of disease and our unease with it, and the body as a medical object and as a vessel of the human spirit. From January 2010 to February 2011, Constance underwent a number of breast cancer treatments including surgery, chemotherapy, radiotherapy, targeted drug therapy and hormone therapy. Throughout this process, she collected all the bandages that were applied and removed from her body related to the treatments. At the time, this practice was not meant for artistic purposes, but merely as an attempt to secure control over the circumstances in which she had none. Thalken archived these “discard” materials in Ziploc bags and later photographed them on the surface of her bathroom floor. The bathroom became a significant place for her during her treatments, as she stood, daily, on the stone floor, confronting herself and the side effects of her treatment. After completing four months of chemotherapy and during the next two months of radiotherapy, Thalken was compelled for the first and only time to photograph herself, acknowledging her fortitude in passing through the most demanding phase of treatments. While she no longer recognized herself, she was curious as to what the scrutiny of the lens would reveal. In 1.2cm = Thalken bravely exhibits these portraits, which she considers to be the heart and soul of the project, alongside the “discard” materials. The exhibition juxtaposes the qualitative effects of cancer on the body with an eye-opening, quantitative analysis of the disease including the staggering amount of medical expenses, drug doses, medical appointments, etc. that go into treating a relatively small, 1.2cm tumor. The whitespace blog will be featuring Constance Thalken as our inaugural Featured Artist, so stay tuned for an interview with Constance to learn more about her work, as well as details about her upcoming artist’s talk at the gallery! 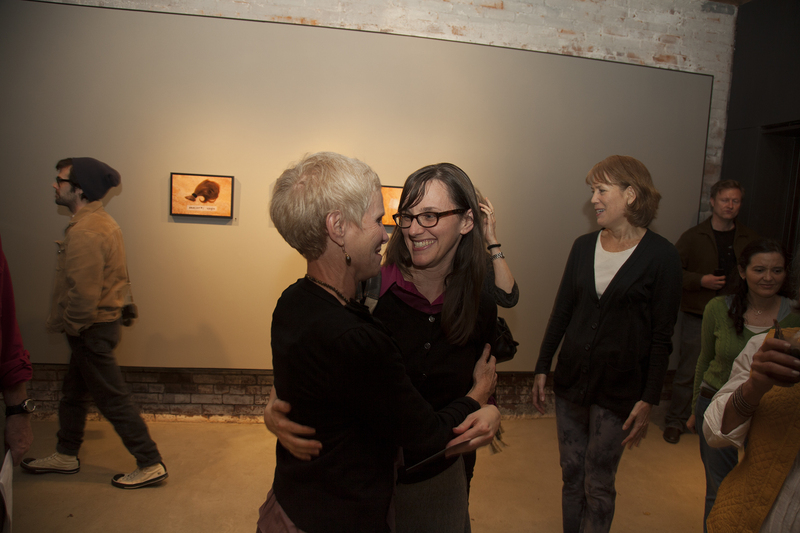 For photographs from the opening reception, please visit our facebook page. This entry was posted in art exhibition, Art Opening, Constance Thalken, photography and tagged 1.2cm =, art, atlanta art, breast cancer, cancer, Constance Thalken, photography, whitespace on January 19, 2013 by Whitespace.